The Dolphin Royal Swim is an activity-packed Jamaican experience that will last a lifetime. 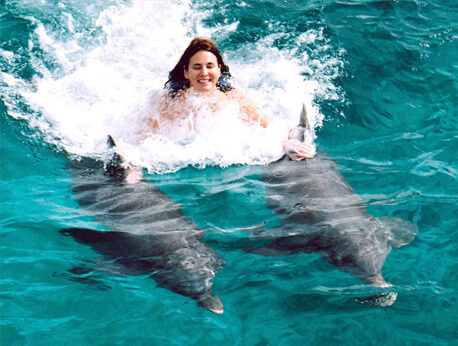 Enjoy a full day of private swimming and snorkeling with dolphins and stingrays. Also included in your package is glass-bottom kayaking, nature trail hiking, and much more! Make memories interacting with and learning more about the ocean's most fascinating creatures. Ready for a Jamaican dolphin adventure that you will remember forever? Enjoy the luxury of swimming privately with two dolphins in our secluded cove. You can enjoy your Jamaican vacation at Dolphin Cove Ocho Rios where you can savor the entire day by relaxing and enjoying the many activities that the Dolphin Royal Swim package has to offer. Once you receive a brief orientation, you will dive into the deep sea with our dolphins and experience swimming with them. Interact first hand with our two dolphins by playing, splashing, kissing, and maybe even being gently pulled by their dorsal fin. The dolphins may also give you a hug, a foot push, or a handshake. Swim alongside these playful and curious creatures and celebrate the experience of a lifetime! Not only will you swim with our two dolphins, but you will also get the chance to swim, interact with, and even pet stingrays. Don't worry, their barbs are removed! Snorkel with the stingrays and enjoy a comfortable ride in our glass-bottom kayaks. The colorful and wondrous sights of the sea will take your breath away! Have deep sea mammals always allured you? Have you always wanted to experience more of the jungle wildlife? In the Dolphin Royal Swim package, you can also enjoy a hike on our nature trail where you can experience exotic snakes, birds, and other jungle animals. We even offer a shark show where you can learn where these fascinating and alluring creatures make their home. To top it all off, you can captain your own mini boat cruise on the Caribbean Sea. This activity-packed and fun-filled package only costs $199 for adults age 13+ and $99 for kids age 6-12. Keep in mind that all participants must be able to swim. Children under 4'7" must be accompanied by a paying adult. And, life jackets are required for the water activities. All of the facilities are accessible by and can accommodate wheelchairs. With the Dolphin Royal Swim, you can spend the entire day enjoying these many fun-filled activities, getting your hair braided on the beach, tasting some exotic spices and fruits, or simply relaxing. If you are looking for a dolphin swim vacation that will last forever and build lifelong memories, then call today to make a reservation!